If you’ve ever locked yourself out of your car you know how frustrating that can be! Late for work, locked out of your car in a mall parking lot or stranded late at night, being locked out of your vehicle can ruin your day or even be dangerous. Car doors security and auto lock technology are continually improving and getting back into your vehicle quickly and without damaging the vehicle can be difficult, especially if you don’t have the right tools and experience. Our experienced auto locksmith technicians are trained and have the proper tools to quickly open your locked car door. Depending on your make and model of vehicle will dictate how we cat you back into your car. Listed below are a few different methods for opening a locked car without using the keys. Depending on the make, model and year of your vehicle, some technicians may be able to unlock the door with special lock picking tools. Using a tension tool and picks, they can move the pins to pick the door lock. 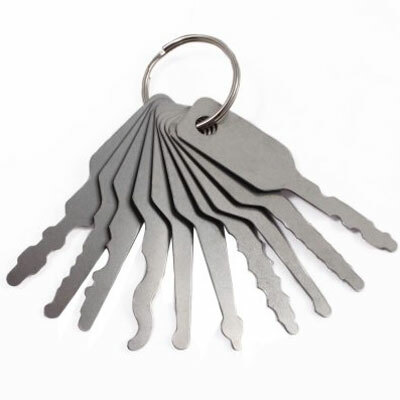 You could also use a jiggler which is sort of a pre-made generic type key that comes in set for specific vehicle makes. Through trial and error you can test and “jiggle” each on to see if it works in your lock. Lock picking and jigglers may not work on newer cars with precision laser cut keys or transponder keys. Popular in movies and TV shows, this is probably what most people imagine when it comes to opening locked car doors. Unlike picking, a slim jim doesn’t try to open the lock itself but opens the door by moving the mechanism in the door. 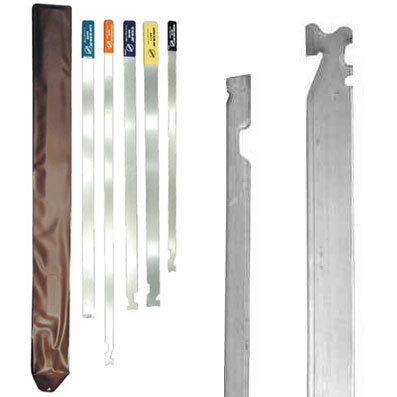 The slim jim is a long flat piece of metal with a notch on the end that you slide down inside the door and hook onto the door latch mechanism and pull it open. Again, like picking, this may not work on newer cars and is usually not recommended to even ty on newer cars as it may damage electronic locks and door airbags. 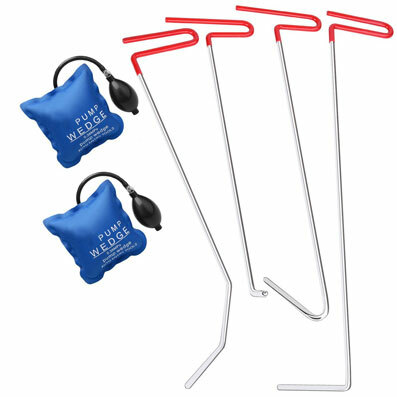 One of the quickest and easiest ways to open a locked car door and without risk of damaging the lock itself is to use tools to wedge open the door at the window and then use a reach tool to open the lock from inside the car. One method of wedging the door slightly open is to use a thin airbag that can be inserted into the door and inflated to create a gap. Then using a long bendable arm tool you can then reach inside the vehicle and unlock the door. See the video below for quick demonstration of this method. Locked out? Call us now for fast vehicle lockout service. Available 24/7!